Hooper Street...home to the first museum grade replica of FDNY's KME Engine 211. From the steel door hinges and cab steps, to the tiny bulb detail within each light, this 1:50 scale replica emulates Engine 211's Severe Service Pumper. Our goal with each release is that our customers may notice something new each time they view the model. Brooklyn's Engine 211 features impeccable detailing and true-to-scale parts that only stainless steel can provide. Fire Replicas has ushered in a new standard in 1:50 scale modeling that is sure to impress the most discriminating collectors. Only 140 units of Engine 211 have been produced. Fire Replicas are designed with the elite collector in mind, and manufactured in limited quantities to enhance long-term value. 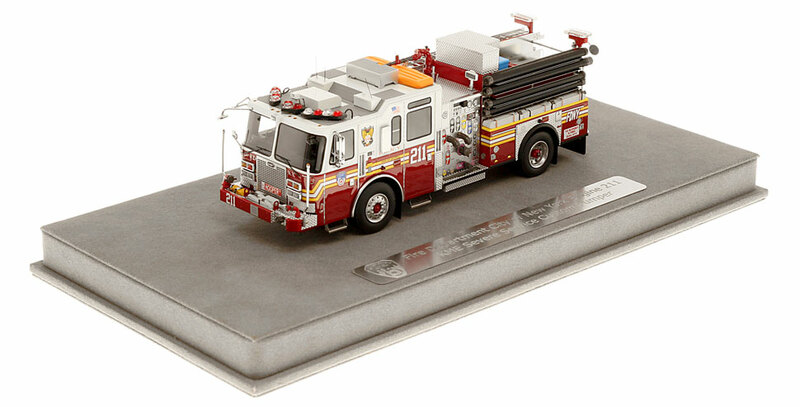 The FDNY Engine 211 measures 7.75"L x 2.5"W x 2.75"T and is securely displayed inside a custom case. The case dimensions are 12"L x 6"W x 5.25"T and the platform includes an etched stainless steel nameplate with the FDNY seal, department and truck name. 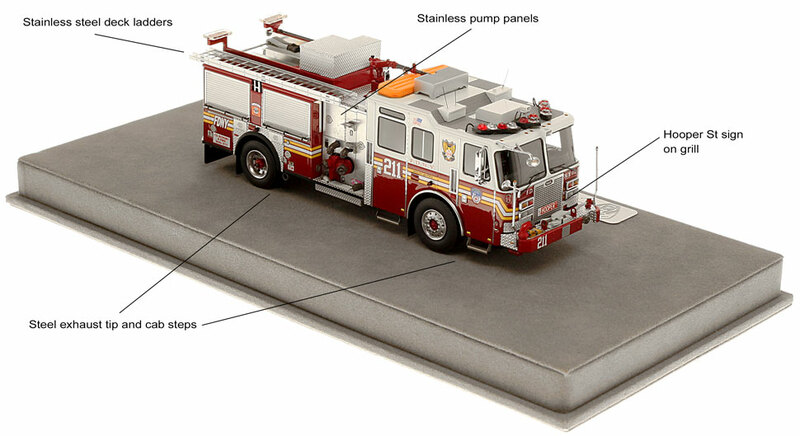 This FDNY Engine 211 scale model is a museum grade replica of the KME Severe Service Pumper. Like all Fire Replicas models, every detail is modeled to perfection and with razor sharp precision. The replica features the specific department configuration and graphics, leaving no detail overlooked. The display case is custom manufactured with high quality acrylic and resin. The stainless steel etched plate features the department and truck name, and department seal. This replica is a treasure to be displayed and admired and is in no way a toy. I have recently received my KME FDNY engine 211 and hands down my absolute favorite flagship Fire Replicas model to date. I have been waiting for Fire Replicas to produce this model of the FDNY KME engine's, it was truly well worth the wait. The model is just unbelievable with the amount of detail from stem to stern. Nothing was missed with real life likeness, this model in comparison is point on. The nose of the truck has captured every detail that has the uniqueness of a KME with it's contour of the windshield, the front grill and diamond plate at the lower area of the nose are an exact duplication to the real rig. Following the rest of the cab and body again just incredible detail and nothing missed. Every possible detail right down to the stokes basket and plumbing under the front bumper for the intake and discharge are of exemplary duplication to the real rig. I have collected all three of the FDNY KME engines produced by Fire Replicas as they are truly my flagship center stage to my collection of fire apparatus, I feel this as well as the other two FDNY KME engines are of the highest quality true museum like 1/50 scale replicas produced. The unbelievable detail and quality is outstanding, on a scale of "1-10" I would rate it a "15" once again just outstanding detail, Fire Replicas has out done themselves with this replica. Every new release seems as though they have set the bar higher . Can't wait for whats next in the production line, will be difficult to outdue these FDNY KME engines. I look forward to whats next in the production line, thank you Fire Replicas. Just when you think it couldn't get better, Fire Replicas again raises the bar on detail and accuracy. The new FDNY KME Severe Service pumpers are simply awesome. E211 is a perfect example of the attention to detail Fire Replicas has shown with these new KME models. Sure you get the usual Fire Replicas stuff: crisp casting, super-detailed with heavy use of photo-etch throughout. 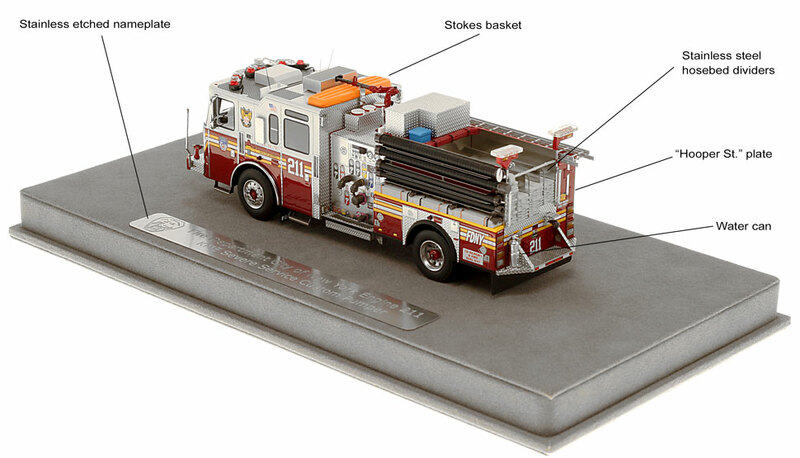 Plus perfect fit, finish and markings and you have a faithfully reproduced FDNY Engine. But no, you get more! E211 includes a super detailed pump panel, along with specific to E211 features such as the stokes basket, water can and Hooper Street plates. Amazing in every way! Do not miss out on this model, there are only 140 available!